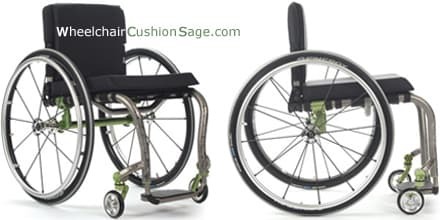 The TiLite ZRA wheelchair can generally be categorized as an ultra-light wheelchair due to its exceptionally light weight (<20 pounds depending upon configuration). TiLite's ZRA is sometimes referred to as the more adjustable ZR. TiLite—the manufacturer of this product—specifies this wheelchair as follows. Note that the front frame tubes can be made parallel, as seen on the TiLite ZR picture, rather than tapered as seen here. The frame and other chair features can be customized in a variety of ways as indicated on the order form.